Karin Ganga Sheppard grew up on Nantucket. 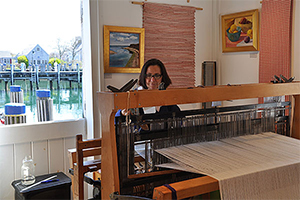 As a young girl, she was fascinated by the weavers at Nantucket Looms and the beautiful fabrics they created. She often dropped in after school to witness yarn being transformed into scarves, stoles, and throws. After graduating from college, she, too, became a weaver at the Looms and worked there for twenty years. She learned her craft from two master weavers: the internationally-known Andy Oates and Sam Kasten. In January 2000, Karin formed Island Weaves, featuring hand-woven items incorporating her own designs. Her products are crafted from high-quality natural fibers and feature throws made of silk, alpaca, mohair. Her "Island Wedding Shawl" is made of 100 percent silk and comes in a wide range of colors for both brides and bridesmaids, a fitting accompaniment to weddings in the chapel or on the beach. Her versatile line also includes multi-fiber scarves and shawls, washable baby blankets, cotton hand Towels, even silk eyeglass cases. Her "Madaket Mall Mats" are rugs woven from recycled towels, jeans and khaki pants. "I pride myself on making heirloom-quality goods," she says. "For example, the wedding shawl can find later use as a christening blanket, or as a wrap for a night out."